Southern sea otters (Enhydra lutris nereis), also commonly known as California sea otters represent an important conservation story. 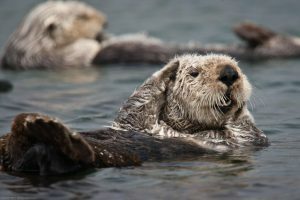 Sea otters are very unique compared to other marine mammals. Sea otters belong to the weasel family and are the only member of the family that exclusively inhabit the ocean. Sea otters are known to be the smallest of all marine mammals in North America. Interestingly, sea otters are the only marine mammals that do not have blubber to stay warm. Instead, they have extremely thick, multi-layered fur. Sea otters have approximately one million hairs per square inch. For reference, humans generally have 100,000 hairs on their head. Their thick coat requires maintenance, so each day otters dedicate hours to grooming and fluffing their fur. The range of sea otters has changed throughout history as the population has been greatly affected by factors such as the fur trade, oil pollution and orca predation. Prior to the fur trade during the 18th and 19th centuries, sea otters occupied a much larger range than they do today. Sea otters could be found from the North Pacific Rim from Hokkaido, Japan to Baja California, Mexico. 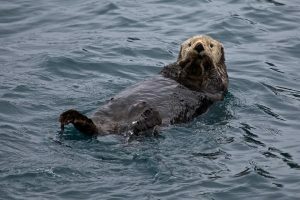 However, today California sea otters range from Monterey Bay, CA to Santa Barbara Counties. According to the U.S. Fish & Wildlife Service California sea otters have reclaimed just 13 percent of the range occupied before fur trade. In 1977 California sea otters were labeled threatened under the Endangered Species Act. With the help of the Marine Mammal Protection Act the threatened species is considered a fully protected mammal. The actions to protect sea otters were essential to even partially recover the depleted population and coastal range. Sea otters are a keystone species and therefore are extremely ecologically valuable. 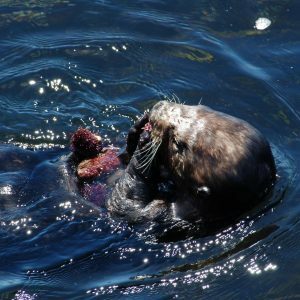 As a keystone species, sea otters have a larger effect on the surrounding ecosystem and its overall stability compared to other community members. The species interaction between sea urchins, giant kelp and sea otters defines the otters as keystone species. Sea otters feed on sea urchins as well as other invertebrates. Kelp forests serve as habitat for sea otters, a primary food source for sea urchins and act as nurseries for several aquatic species. Without the predation pressure of sea otters feeding upon urchins, the urchin populations are known to explode thus dramatically reducing the abundance of kelp forests. With the sea otters maintaining the balance within the ecosystem, kelp forests are able to continue serving as a nursery habitat, providing countless aquatic species with the opportunity to mature. While their population has increased, sea otters are still threatened and face a multitude of risks. This is why I encourage you to continue researching and learning about the beauty and significance of sea otters and their interactions with the marine world. Stories such as this one empowers us all to push for the conservation of marine species because the health of our ocean depends on it.